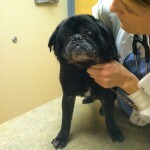 Drew is receiving veterinary care which included removal of all of his teeth. Poor guy had to have been in a lot of pain. We will have an update soon from the foster home.